The team presented a vision for a world-class, 100-acre Grand Park that the entire Reston community would be able to enjoy and shape. In creating this vision, our team examined other signature parks such as Merriweather Park in Columbia, Md., and Prospect Park in New York City. The vision presented included both passive and active recreational amenities, an indoor tennis facility, the Blue Trail and other trails providing community connectivity as well as cultural elements that adhere to Bob Simon’s Principals [sic] for Reston. The Grand Park preserves more than 60 percent of the site as public open space. With additional trails and open spaces included within the development areas, as much as 75 percent could be open space. The remaining land would be planned for a variety of housing, some of which will help meet Reston’s needs for senior, workforce and affordable housing to continue Reston’s heritage of being an inclusive community. The exact number of homes has not been discussed as we are in a conceptual stage. However, we can say the housing, if approved, would be a mix of townhouses, single family and multi-family homes. High density development and "destination-worthy open-space amenities" (like, you know, a golf course, except not). We've got to admit, the high-density, high-amenity option is appealing, and it does adhere to the principles set laid out by Bob Simon, who repeatedly said it was high density that made all of Reston's green space possible and would have had multiple Heron House-like high-rises ringing Lake Anne had the late 60s, free love version of NIMBYs not gotten in his way. And you've got to give Wheelock credit for putting time and effort into trying to engage with the community, unlike a certain insurance company that thought it could arrogantly bulldoze its way into building midrise woonerfy awesomeness without engaging anybody. Reston homeowners must abide by the agreement that they made when buying here: to be Reston Association members, pay RA dues, and agree to the land-use rules that apply. 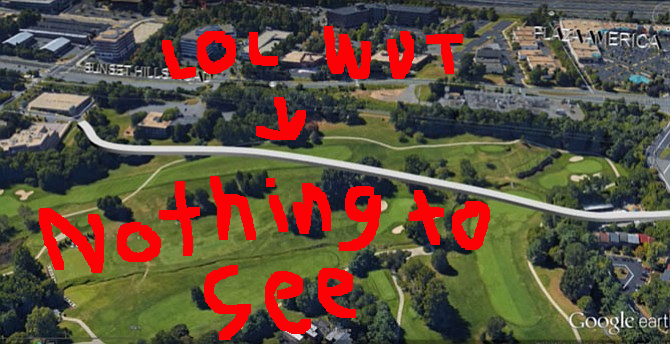 Purchasers of the golf courses in Reston should be equally bound. Wheelock knew—just as we homeowners did—that they were buying into a planned community with stipulated land-use rules that restrict what owners can do with their property. And the golf course land is NOT for housing. The next step in the process? Wheelock is presenting its vision for the Grand Park to the Reston Association on September 27, followed by a presentation from Rescue Reston. Of course, the RA has no power over what happens; that's ultimately up to the Fairfax County Board of Supervisors, which could entertain a rezoning proposal from Wheelock. We've said before the county hasn't exactly been a staunch defender of Reston's principles at all times, and a promise to build a sweeeeeeet Grand Park the county doesn't have to pay for itself would certainly be an attractive enticement for it to overlook some of those principles, just as county planners overlooked Hidden Creek in the first place when it stuck a proposed road across a couple of the fairways a while back. County officials say the road is entirely conceptual in nature, but could possibly be needed to improve connectivity if planned redevelopment happens in the Isaac Newtown Square area. The road could also relieve congestion at the intersection of Sunset Hills Road and Wiehle Avenue by serving as an alternative route to Sunset Hills Road, according to Robin Geiger of the Fairfax County Department of Transportation. “As with any new roadway design, the county will work to minimize negative impacts on existing uses and the environment. In staff’s view, the planned road being shown as part of the conceptual street network does not negatively affect the viability of the Hidden Creek Golf Course,” Geiger said. All's we know is if we wind up getting a Grand Park, we want horse-drawn carriage rides down the "road to nowhere." If Reston is well on its way to becoming Manhattan, as some metric-challenged critics have argued, we want all the attendant perks. If this fraudulent scheme succeeds, I can see the county bragging about the addition to open space even though the space is cut by 2/3s. A couple of feelings from the point of view of a near-course neighbor. 2) Converting at least some portion of the golf course into public park would drastically increase the number of people that can use of that open space. The only part of the golf course I currently use is the pathway from Charter Oak over to Lake Anne Elementary because I'm ACTIVELY prohibited from going anywhere else on the property. 3) If it were kept as a golf course, that isn't 'natural space' in any meaning of the word. Golf courses (and giant lawns in general) aren't actually good for the environment. Having said all that, I think Fairfax needs to push for more park space (and not the garbage 'linear' parks they are putting in their proposal). 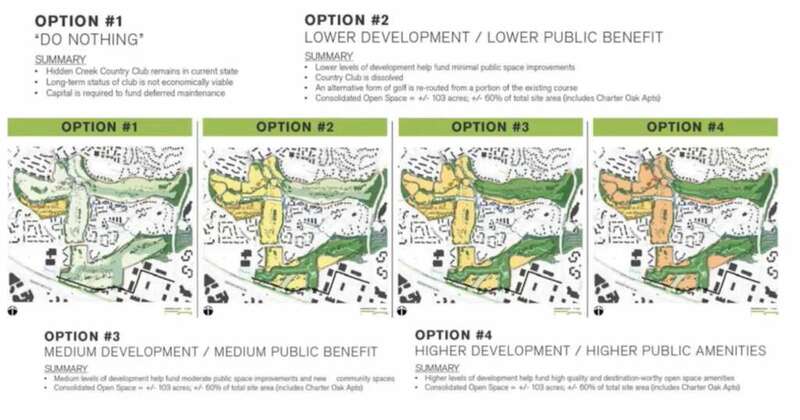 The park also needs to become either Fairfax or Reston Association property. Otherwise, there's nothing to prevent whoever owns those remaining parcels to continue chipping away at the remaining spaces. But there needs to be additional maintenance and upkeep proffers provided in addition to the property itself. Additionally, as we see from Boston Properties and RTC, we need to make sure that we maintain publicly owned common spaces for residents to use no matter how a corporate owner feels about it. A final note, the golf course was 97 acres of property and only cost $14mil yet RA paid $2.6mil for the Tetra property. If they'd bought it and just converted the whole thing into forest and parks I'd have been cool with that. It seems to be a completely foreign idea in 2018 that some people enjoy playing golf. 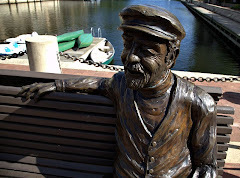 Similarly few acknowledge that Hidden Creek has been part of Reston for decades, or that some members of the community have a deep, emotional attachment to the place. My late father was a member for almost a quarter of a century. Much of my adult life was spent hacking it around with him at HCCC. The memories of those times are dear. It's not like we were scratch golfers (we weren't, trust me). And it's not like Hidden Creek was flawless as a club (food, staff turnover, etc.) But a place like that -- and indeed the game of golf -- can serve to link one generation to the next, the past to the future. And isn't that something we can all value? You are so correct!! Golf is cyclical, and Reston CAN support 2 courses - one public and one private. Example: my grandson played when he was very young. Then no time due to travel soccer. Then he played in H.S. Then no time. Now he plays Division I soccer at VA Tech. Freshmen only get one year in campus housing, so this weekend we were looking at a potential spots for him and several of his teammates for next 3 years. Clubhouse there has a golf simulator and my grandson's eyes lit up. We are told that it is used a lot and I know he'll bring any of his buddies who haven't golfed to try it out. As he graduates and moves on in the business world, it is golf that he'll be playing more than soccer. Now - look at the photos of this place and tell me that successful graduates aren't going to want to have similar environments for themselves in their futures. So, your solution to explosive population growth is...more population growth? Next time it takes you 30 minutes to go from Sunrise Valley to Baron Cameron in rush hour, come back and tell us what an extravagant experience it was for you.